If you are anything like me, your basement has slowly filled up with gallons and gallons of old paint. One project after another goes by, wall colors have been changed, and the partial cans of paint sit downstairs for years taking up space. Several rooms in my house have changed colors more than once, so the result is an even bigger collection of old paint. Get back valuable shelf and storage space in your basement by getting rid of those old cans of paint this fall. 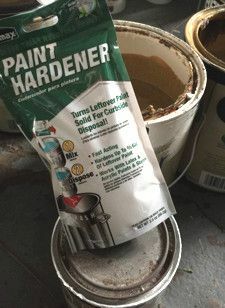 Our Homax latex paint hardener is the perfect product to help you do so. It takes as little as 30 minutes to dry solid. And just like that, the paint will be ready for curbside pickup! Take a look at this quick video below that shows how easy the Homax paint hardener is to use.